Transparency Market Research has published a new report on the global immunoprotein diagnostic testing market. As per the report, the global immunoprotein diagnostic testing market stood at US$11 bn in 2012 and is predicted to reach US$15.3 bn by 2019 at a 5.70% CAGR through this period. The report, titled ‘Immunoprotein Diagnostic Testing Market - Global Industry Analysis, Size, Share, Growth, Trends and Forecast, 2013 - 2019’, states that the global immunoprotein diagnostic testing market is predicted to expand due to factors such as increasing demand for preventive healthcare and increasing need for accurate disease diagnosis. Immunoprotein is a part of the defense mechanism of the human body and shows characteristic serum concentration under irregular conditions. Immunoproteins’ concentration is regarded as an indicator for the diagnosis of various diseases. On direct exposure to antigen, the level of immunoprotein increases 10 to 100 fold within a period of 24 to 48 hours. Application of immunoprotein has shifted to rapid testing from microbial testing in recent years. The global immunoprotein diagnostic testing market is constantly fueled by advanced technologies that are expanding the market’s boundaries and shrinking product lifecycles. 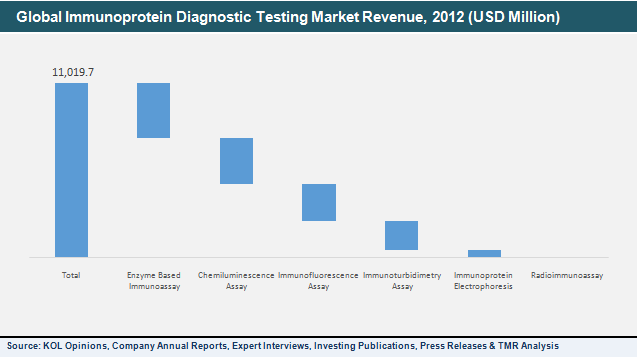 The global immunoprotein diagnostic testing market is segmented on the basis of geography, application, assay technology, and types. By type, the global immunoprotein diagnostic testing market is classified into free light chain diagnostic tests, C-reactive protein diagnostic tests, complement system protein diagnostic tests, prealbumin diagnostic tests, haptoglobin diagnostic tests, and immunoglobulin diagnostic tests. Factors such as accurate and effective diagnosis of injuries, stroke, cardiovascular diseases, and inflammation-related disorders, have enabled the C-reactive protein diagnostic test sector to develop rapidly in the past few years. Based on technology, the global immunoprotein diagnostic testing market is classified into radioimmunoassay, enzyme-based immunoassay, immunofluorescence assay, immunoturbidity assay, chemiluminescence assay, and immunoprotein electrophoresis. In 2012, the chemiluminescence assay sector dominated the global immunoprotein diagnostic testing market due to its ease of use, safety, wide-scale application, and sensitivity. Over the past few years, clinicians and doctors have shifted their preferences towards effective and safer tests, leading to a drop in the radioimmunoassay testing sector. Endocrine testing, infectious diseases, oncology testing, allergy testing, and autoimmune disease testing, are some of the applications of global immunoprotein diagnostic testing. The oncology testing sector is expected to generate the highest revenue by 2019, reaching nearly US$5 bn at a 6.0% CAGR by 2019. Increasing demand for quick healthcare services is expected to boost the global immunoprotein diagnostic testing market during the forecast period. Based on geography, the global immunoprotein diagnostic testing market is classified into Europe, Asia Pacific, North America, and Rest of the World. DiaSorin SPA, The Binding Site Group Ltd., Omega Diagnostics Group PLC, Siemens AG, Roche Holding AG, Abbott Laboratories, Inc., Thermo Fisher Scientific, Inc., Abcam PLC, Randox Laboratories Ltd., Enzo Life Sciences, Inc., and Fujirebio Diagnostics, Inc., are some of the prominent players in the global immunoprotein diagnostic testing market.